The Tissot T-Race MotoGP Limited Edition T048.417.27.207.01 Men’s Watch is a 2016 model with powerful and prominent racing motorcycle features. From the disk-brake-styled bezel to the tread-like grip on the back of the soft and supple, silicon strap; even the pushers for the chronograph resemble the footrests of the high-performance two-wheeled machines on the track. If you want to detect more similarities, then take a look at the chronograph subdial, which is directly influenced by the motorbike dashboards. But all that aside, this is just one of the 8,888 pieces made; grab yours before someone else does. The details of the Tissot T-Race MotoGP Limited Edition T048.417.27.207.01 Men’s Watch reveal the same lines as found in the bodywork of the track-performance superbikes. Few of them we spoke about earlier; among the rest, the magnifying glass on the sapphire crystal is the most prominent along with the bracelet’s attachment to the case, shaped like the rear-suspension rods. Man’s craze over automobiles has found different manifestations through the ages, so when modern technology provided assistance, there was no looking back for the connoisseurs. It’s an outcome that true aficionados found exciting (in lack of a better word) and every ardent fan of the Moto GP (the most exciting superbike race globally) took this limited edition collector’s timepiece as seriously as they take Nicky Hayden and Valentino Rossi. In short, they were ready for a treat and the Tissot T-Race MotoGP Limited Edition T048.417.27.207.01 Men’s Watch proved to be just the appropriate one. 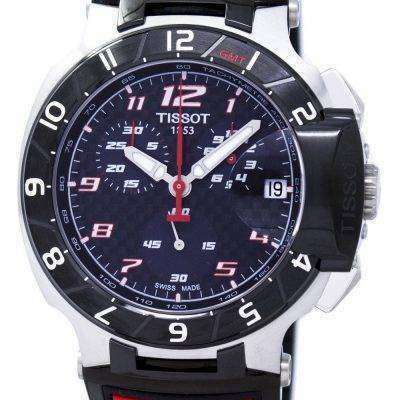 Why the Tissot T-Race MotoGP Limited Edition? Timing is integral to racing – from the start to the end. This puts the burden on the timekeepers; keeping track of the accuracy of timing is absolutely crucial. So, it’s no wonder that Tissot was called forth to fulfill the duty; their association with racing for almost two decades is celebrated by this official, limited edition watch. As a timing instrument, the Tissot Watches For Men keep track of every millisecond passed to give the most accurate time-related readings and this makes the Tissot T-Race Automatic Men’s Watch the personal preference for riders, not just as an instrument for measuring accurate time. So, as a tribute to motor-racing, the T-Race Moto GP features every single detail of the sport; from the black carbon dial to the chrono-layout, everything replicates the exact look and feel of the superbikes. Apart from the racing looks, the Tissot T-Race Men’s Watch is all about precision. A Swiss-made G10.212 quartz movement sits inside the watch, which brings about its super-accuracy and makes you worry-free about being spot-on with timing. Add to it a tachymeter on the bezel and you are equipped for all sorts of speed related calculations; even for more accurate speculations about who’s gonna come first!